Wood chips make one of the best landscaping mulches available in North America, according to Washington State University, because they don't decompose rapidly, are aesthetically pleasing and are low in cost. 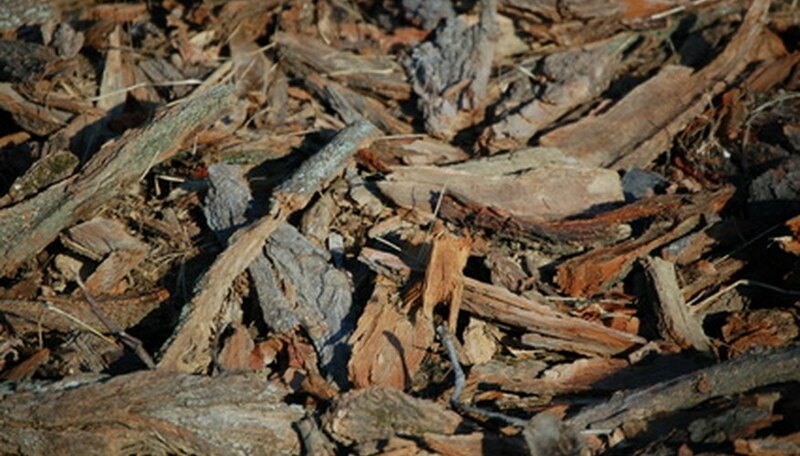 Landscapers commonly use wood chips as a substitute for inorganic walkway material like gravel, as an ornamental bedding mulch that helps conserve moisture and conditions the soil and as a tree mulch to make maintenance easier. Remove all unwanted surface vegetation and debris in the area in which you plan to use the wood chips. Begin such preparations in the early spring before annual weeds begin germinating, according to Washington State University. Spread 1 inch of compost on the bare soil if you're laying the wood chips around shrubs, trees and other desirable vegetation. Washington State University says that this helps condition the soil under the wood chips and mimics the natural layering seen in forests. Such layering isn't needed if you're laying the mulch for simply decorative purposes. Apply the wood chips as a walkway. When used for such landscaping purposes, it helps keep down dust during dry periods and protects the soil from becoming compact during wet periods, according to Kansas State University. Make the wood chip layer 8 to 12 inches thick. Use the wood chips as a decorative mulch around bedding plants. Scatter the mulch to a depth of 4 inches, and keep a 3-inch area open around the base of each plant, according to Kansas State University. Spread the wood chips as a ring around trees. Kansas State University recommends using it in a 4-inch-thick, 6-foot-wide ring around newly planted saplings to keep weeds at bay and in a 1-foot circle around established trees to keep grass away from the trunk and make it easier to mow the area. Keep wood chips at least 30 feet from flammable structures like a home's exterior walls or a wood porch or balcony, according to the University of Arizona. This decreases the risk of fire hazard should the wood chips ever ignite.